Thea Dunmire and Kathy Seabrook. ISO/PC 283, the committee overseeing the development of the much-anticipated ISO 45001 standard on occupational health and safety management systems, met on two recent occasions, June 29-July 3, 2015, in Dublin, Ireland, and Sept. 21-25, 2015, in Geneva, Switzerland. The two meetings were designed to meet in task groups to address 2,400 comments on the second committee draft before meeting as one group to address major issues. Vic Toy, CSP, CIH, chair of the U.S. TAG to ISO/PC 283, reports that 109 delegates, representing 33 countries and 7 liaison organizations registered for the working group meeting in Geneva. Overall, Toy and the rest of the TAG delegation, which included Kathy A. Seabrook, CSP, CFIOSH, EurOSHM, Vice Chair, Thea Dunmire, JD, CSP, CIH, subject-matter expert/representative, and James Howe, CSP, TAG Membership Subgroup Chair, say the U.S. was successful in addressing many issues of concern to the U.S. “The U.S. delegation had many wins during the Geneva and Dublin meetings, which will be reflected in the soon-to-be-published DIS,” Seabrook says. However, as with any standards development project in process, some significant issues remain for the committee and key stakeholders to tackle. “There continues to be significant issues of concern to the U.S., including the prescriptive nature of the draft when compared with ANSI Z10. This may impact the appeal and potential uptake in the U.S. for adopting 45001,” Toy explains. He also notes that some U.S. users and auditors may find the standard confusing due to what they view as redundant requirements and inconsistencies. “We are hopeful, however, that the editing conducted by the secretariat and ISO will improve readability and understanding of the requirements,” he adds. use of the term non managerial worker as those with no supervisory responsibility. In addition, the group indicates that ISO’s Annex SL and the ongoing harmonization effort will require coordination with other U.S. management system standard developers such as TC 207 (environmental), TC 262 (risk management) and TC 176 (quality). However, the harmonization effort is valuable and a vehicle does exist within ANSI for doing this. 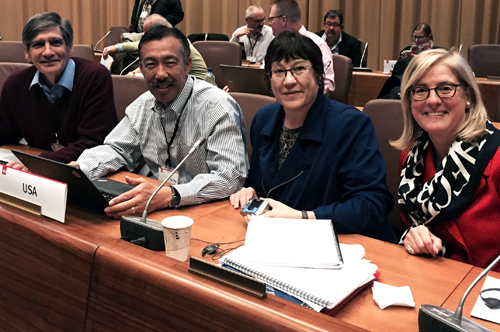 Among several new developments, a resolution was adopted, with U.S. agreement, to submit a new work item proposing development of a new part to ISO/IEC 17021: Conformity Assessment: Requirements for Bodies Providing Audit and Certification of Management Systems--Competence Requirements for Auditing and Certification of OH&S Management Systems. The TAG will now begin to meet remotely to address the issues of concern and to work on U.S. comments once the DIS is released during the 2-month translation periods. The release of this draft for public comment is expected sometime in January/February 2016. Planning is also underway for a face-to-face TAG meeting in February. The TAG leadership is also hopeful that ANSI will work to further promote integration of management systems among U.S. stakeholders. “With the release of the revised management systems standards, ISO 14001 (environmental) and 9001 (quality) based on standardized harmonization language, ANSI should consider forums to aid organizations looking to take an integrated approach to implementing these standards along with ISO 45001 and ISO 31000 (risk management),” Toy advises. Click here to view a PowerPoint recap and additional insight about the next steps. American Society of Safety Engineers. Theme images by Ollustrator. Powered by Blogger.